Yoga Pod is here to help you build your physical skills & challenge you along the way. Our classes are built for all levels, from beginner to advanced, and will guide you to a greater state of health, well-being, & connection. Through our exceptional class offerings you will transform your body, elevate your mind, & open your heart. Provides an opportunity for beginners to create a solid foundation. Class moves at a slow pace, allowing students time to explore alignment and fundamental aspects of the postures. 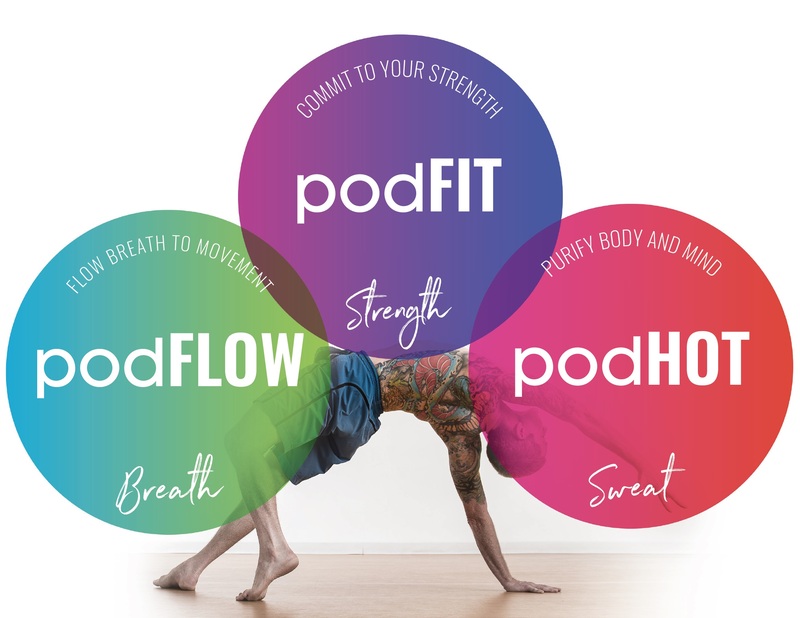 podBASICS classes rotate weekly between set sequences, focused on specific types of postures, and provide the necessary foundation to advance to podFLOW 1 and 2 classes. Classes embody the true spirit of vinyasa yoga, breath-synchronized movement, set to music. While podFLOW 1 provides a physical challenge, the class is suitable for all levels, from beginner to advanced. Classes begin with an active and intentional warm-up, and progress through sequences designed to build strength and flexibility. podFLOW 1 utilizes set sequences that change with the seasons to honor nature’s inherent rhythms. Classes, set to music, are dynamic and accessible, offering more challenging postures and variations based on the fundamentals learned in podFLOW 1. Teachers bring their own creative element to podFLOW 2, resulting in diverse and inspiring classes. Each class focuses on proper alignment and safe and intelligent sequencing progressions. podFLOW 2 is designed to encourage sweat and detoxification, as well as reduce stress. The room temperature is set at 95 degrees with 40% humidity. A fun and vibrant fitness-based class, taught to the beat of high-energy music, designed to provide balance to your practice. podFIT begins with an active, full body warm-up designed to engage your core and prepare all major muscle groups. The class utilizes resistance training and body weight and cardio exercises to accelerate change in the body, build strength, and increase core stability. The class finishes with gentle stretching and a light cool down. Utilizes a set sequence of postures practiced in a room set to 105 degrees and 60% humidity. The class is designed to build strength, create balance and flexibility in the body, and produce a detoxifying sweat. Class includes breathing exercises, a standing series, and a floor series. The 60 or 75 minute classes are set to music and suitable for all levels. A towel is required and water is highly recommended. Please come to class well hydrated. Do you have the flow, love music, and love to have fun? We love the flow, the music, and the fun in yoga, it’s what makes the movements come alive. One way we encourage students to feel the flow is through Sweat. Heat. Beatz. It’s a class that focuses more on flowing through the poses yet to decidedly “unyogic” music. Other classes help perfect alignment, but Sweat. Heat. Beatz. brings together all levels in a room where people can move to their own beat. We pump the heat and the music, take it back a notch on the cues and the verbiage, and let students zone in on their own meditative flow through the class. Finally, students may be interested in a more relaxing class that helps increase joint mobility and improve flexibility. YIN classes offer just that for students of all levels. This class is relaxing, but the results are achieved through moderate intensity through long holds. Our teachers guide students to hold postures passively for 2-5 minutes in order to give the body time to ease into the new areas of flexibility and mobility; this gently stresses connective tissues (tendons, ligaments, and fascia). Your body will work hard, so we set the room at a comfortable 80 degrees, keep the music soft, and the lights down low. is to create a vibrant yoga community where you can transform your body, elevate your mind, and open your heart. is to redefine fitness and forge a sustainable, intentional yoga practice through breath, strength, and sweat. beliefs we hold in such high esteem, significantly affecting the way we speak, think, and act. Our shared intention is the culmination of our mission, vision, and values. It is the coalescence of how we live our lives and how we inspire others. Our intention guides our practice, on and off the mat. We root our philosophy in our mission, vision, values, and intention. We offer a physically challenging, yet sustainable practice, and utilize the science of “flow states” to achieve heightened levels of focus and attention. We recommend that you try all of our styles to experience the breadth of our offerings. Importantly, we are here to help guide you. We too were once in your shoes, both as a brand new student and as an avid practitioner. We are here to guide you during your yoga and fitness journey at any moment. Please call our studio or talk in person to any of our excellent staff and they will be able to assist you directly. Most importantly, know you can do this!